Continuum, Call of Duty: Infinite Warfare’s second piece of DLC, is finally coming soon to a PS4 near you (and then other platforms a month later). The expansion, which includes four new multiplayer maps and the ’70s inspired Shaolin Shuffle, the next zombies co-op chapter, will be ready to go for April 18th, 2017. Season Pass holders get the DLC free of charge and crazy gamers who like to buy these things a la carte can pick it up for $15. See the announcement, trailer and the key art poster below. Activision and Infinity Ward have released the first details for Call of Duty: Infinite Warfare Continuum, the second DLC Map Pack for 2016’s No. 1 top-selling console video game in the U.S. (excluding hardware bundle sales), Call of Duty: Infinite Warfare. Featuring four diverse, new multiplayer maps, and a new zombies co-op experience called Shaolin Shuffle, set in a ‘70s era New York disco-zombie fright fest, Continuum is scheduled for release April 18, first on the PlayStation Network for the PlayStation 4 computer entertainment system, with other platforms to follow. Shaolin Shuffle, the next thrilling chapter of the Call of Duty: Infinite Warfare zombies experience, features the return of Willard Wyler, the mysterious movie director villain portrayed with voice and likeness by Paul Reubens (Pee-wee’s Big Holiday, Gotham). This time, Wyler has trapped the four protagonists inside a new horror film, set in the unforgettable 1970s. Players will face all-new zombie enemies across a variety of disco-era New York locations, including subways, flashy nightclubs and a martial arts dojo headed up by the “Shaolin Sister,” played with voice and likeness by Pam Grier (Jackie Brown, Foxy Brown). In addition to hallmark Call of Duty action, Shaolin Shuffle introduces four unlockable kung fu fighting styles, each with its own set of unique combat moves. Seth Green (Robot Chicken, Austin Powers) as “the Punk Rocker;” Ike Barinholtz (Neighbors, Suicide Squad) as “the Sleazebag;” Jay Pharoah (Saturday Night Live, Ride Along) as “the Street Poet;” and Sasheer Zamata (Saturday Night Live, Inside Amy Schumer) as “the Disco Chick,” all return from the ongoing story in this all-new experience. Turista – A plush spa and resort, Turista is nestled in the middle of a giant skeleton of an ancient creature. With sniper spots scattered across a majestic, central waterfall, Turista also boasts tight interiors for fans of close-quartered combat and a three-lane design that caters to a variety of play styles. Scrap – Set in an abandoned junkyard on the Moon, Scrap features a combination of extended sightlines and tactical pathways that reward players who engage in both long and short range combat. Archive – Fast, frenetic engagements set the pace in Archive, a post-futurist art gallery where tight engagements contrast with open exterior battlegrounds in this wide three-lane style map. Excess – Perched atop a gilded penthouse in a sprawling future metropolis, Excess is a small, circular map re-imagined from the classic Modern Warfare 2map, Rust, that retains the intense, fast-paced combat from the original. Call of Duty: Infinite Warfare Continuum DLC Map Pack is available for a great value via the Call of Duty: Infinite Warfare Season Pass, which can be purchased on its own or obtained as part of the Legacy Pro or Digital Deluxe editions of the game. 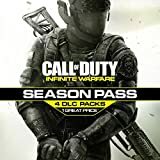 Season Pass gives discounted access to all four Call of Duty: Infinite Warfare DLC Map Packs released during 2017 (discount based on a Season Pass suggested retail price of $49.99, and four individual DLC Map Packs at a suggested retail price of $15 each). Upon purchase, Season Pass owners also receive the three new base weapons released to date, as well as 10 Rare Supply Drops and 1,000 bonus Salvage Credits to craft new prototype weapons. Call of Duty: Infinite Warfare is published by Activision Publishing, Inc., a wholly owned subsidiary of Activision Blizzard, Inc., and developed by Infinity Ward. Call of Duty: Infinite Warfare Continuum releases on April 18, 2017 first for the PlayStation 4, with other platforms to follow. The game is rated M for Mature (Blood and Gore, Drug Reference, Intense Violence, Strong Language, Suggestive Themes). For more information, please visit www.callofduty.com. Fans can also follow @CallofDuty on Twitter, Instagram and Facebook.